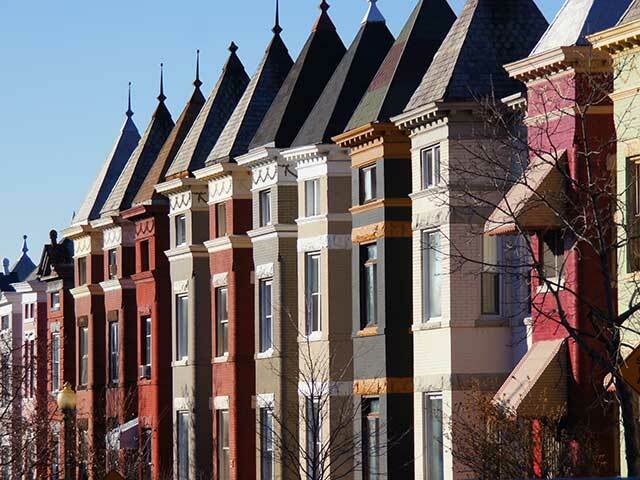 Tucked between North Capitol Street and Second Street in northwest D.C. is an enclave of tree-lined streets and early twentieth-century brick row houses, many topped with conical towers and many built by the era’s dominant developer Harry Wardman. It’s known as Bloomingdale, named for a former estate that was divided and sold in 1889. Only two miles north of the U.S. Capitol, the area attracted development when the North Capitol streetcar line extended and a commute to downtown became possible. Bloomingdale’s mix of row houses, some elegant and spacious and others more modest, attracted a range of buyers. During the walk, you’ll be introduced to many of the prominent residents who located there as well as to the architects who gave these blocks a distinctive character. Although Bloomingdale builders often put restrictions in deeds that stipulated houses could be occupied only by whites, the neighborhood’s location and housing stock made it especially attractive to black buyers, many who were employed at nearby Howard University. One was the attorney who helped abolish racially restricted housing nationwide–based on a case involving a property in Bloomingdale. We’ll show you where. We’ll also reveal the location of a “secret” park. Available for private and group bookings. Contact us for details. Embarks from the little park across the street from Big Bear Café (1700 First Street, NW).